I’ve been swimming in garbage of late, and as a result some of my finds take a while to get processed. This painting is a good example. I found it months ago and immediately thought it was really cool and very well done. Still, it went into my garage where it sat largely forgotten until yesterday, when I finally got around to doing some basic research on it. The top left is signed Alleyn 65. 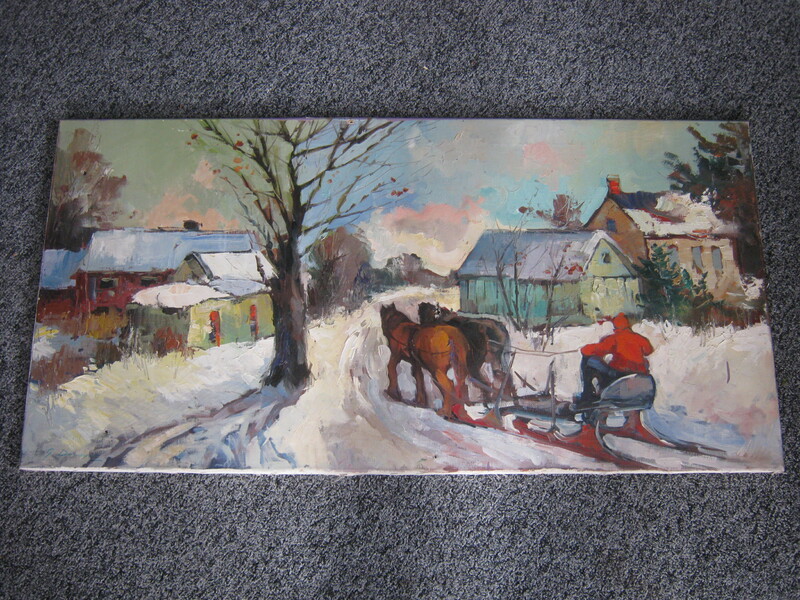 It didn’t take me long to find out that it was likely made in 1965 by Edmund Alleyn, a well regarded Quebec artist. The signature is very similar to ones seen in this Google image search. The work also bears resemblance to some on Alleyn’s bio for that time period; his “Période Technologique.” He died in Montreal on Christmas Eve, 2004 at the age of 73. 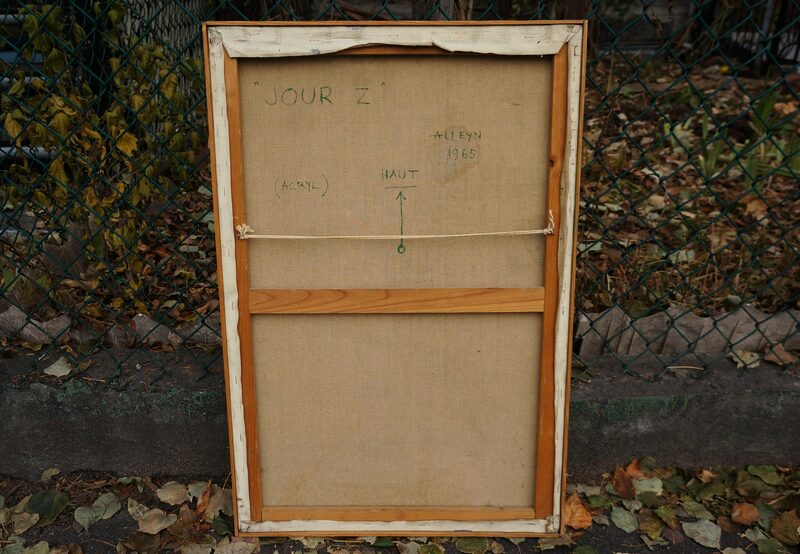 This piece is titled “Jour Z,” which I cannot seem to find reference to online. By all accounts Alleyn was a brilliant artist, perhaps a bit ahead of his time. There was a retrospective of his work recently at the Montreal Museum of Contemporary Art, and the National Gallery of Canada owns 11 of his pieces. The painting is unfortunately a little bit damaged. There are a few stains from water dropping on it, and a few small places where the paint is chipped or the canvas ripped. However, I don’t think these issues take much away from the piece, and I suspect they could be restored fairly easily by a professional. Assuming the painting was indeed done by Alleyn, it could be worth a fair bit of money. His work has sold at the Heffel auction house for between 1,256 and 16,250$. Because of the damage I expect that the upper part of that range is far out of reach, but I still think it’s likely that the painting could sell for somewhere in the four figures (for reference, this one is fairly large, roughly 32 x 21.5″). If not, maybe I’ll just keep it myself! I always thought it was really cool, even moreso now that I know its story. Anyways, what do you think of the painting? And perhaps more importantly, what should I do with it? Let me know in the comments! This isn’t a recent find, but it is one of my favourites. 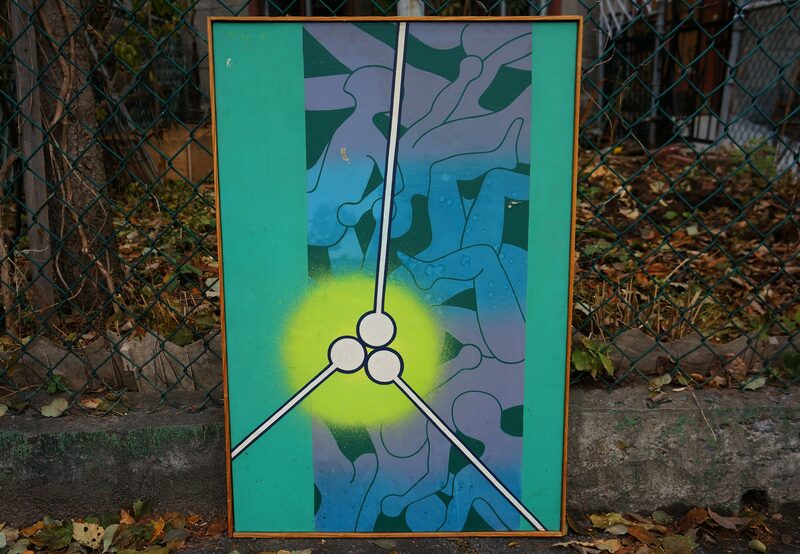 I came across this painting (about 100cm / 50cm, or 3’4″ by 1’8″) in the alley behind my home back when I lived in the Mile-End (and before I ever thought about making a blog about trash). The painter is “G. Duveyre.” Google search doesn’t find too much about him – not even his first name – but the consensus is that he was Canadian. I think it’s a great piece of art. It offers a beautiful snapshot into the Canadian winter, that thing that has played such a large role in our history and continues to define us. This painting portrays rural life before the automobile, or at least before it was practical to use them in winter. Society has become more and more urbanized (due largely to industrialization), but at one point this would have been the experience of the vast majority of Canadians. It’s interesting to think about what life would have been like – the idea of having to make preserves to last you the whole winter, for example. You couldn’t just drive to the grocery store, and you definitely couldn’t buy bananas. Many of the things we take so much for granted today would have been impossible. This art isn’t in perfect shape. There are a few holes – as if someone put nails through it. There’s also a little tear. None of this is really noticeable, however. It now hangs from my wall in my room. It’ll remind to be thankful for my relatively easy life and the easy-going warmth of summer.